This was not terribly surprising. Also not surprising was the fact that firms who follow these five best practices experience testing as a way to gain speed and efficiency, rather than a bottleneck to delivering faster. What caught us off guard, however, was CXOs’ highly inflated estimation of their Continuous Testing, DevOps, and Agile maturity. While most Agile and/or DevOps firms have implemented some of these five core testing practices, few have actually implemented all of them — only about a quarter of respondents say they somewhat or completely agree with all five best practice statements. Moreover, CXOs also reported much higher levels of Agile and DevOps maturity across the board than non-CXOs did. The good news for development, testing, and DevOps professionals is that CXOs are your champions: they believe you’re doing a great job! The bad news is that, at some point, you need to tell them about the gaps that currently exist in the process. You also need to collect and share some of your own data to make the case that actually adopting these 5 proven best practices will help you increase delivery speed while reducing business risk. This was just one of the many interesting findings from the research project, which was led by Forrester Vice President and Principal Analyst Diego Lo Giudice. Understanding of business risk is the most important determining factor of DevOps and Agile maturity. Experts focus primarily on contextual metrics (e.g., requirements coverage) while others focus on “counting” metrics (e.g., number of tests). Experts are more likely to measure the user experience across an end-to-end transaction while others rely on application-specific or team-specific metrics. Detailed results and analysis are available in the complete report: Forrester Research: What Separates DevOps + Agile Leaders from Laggards? In this study, Forrester conducted an online survey of 603 enterprise organizations in North America, Europe, and Asia Pacific to evaluate current software testing practices and metrics tracked during survey development. 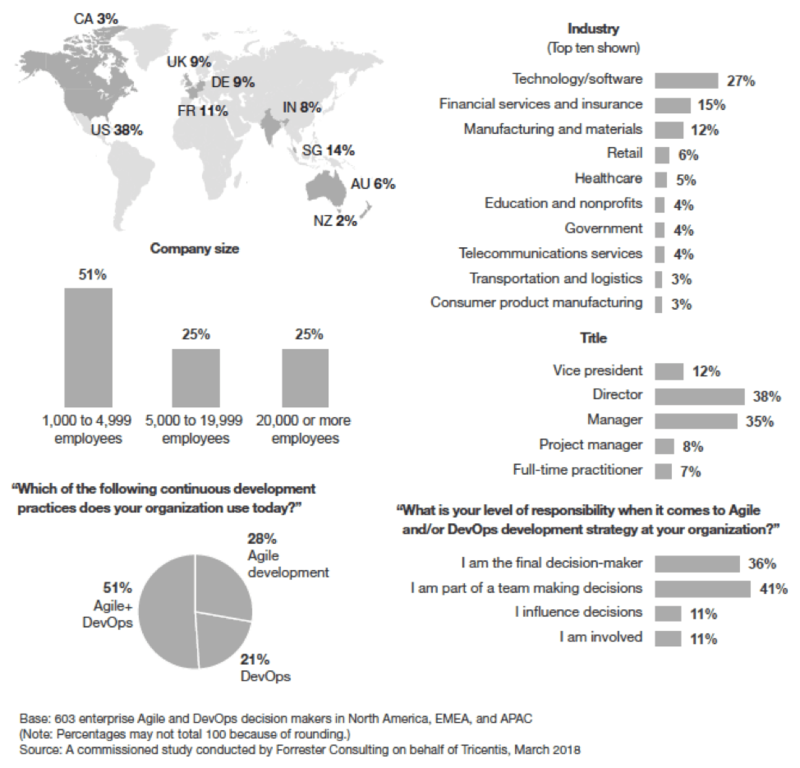 Survey participants included decision makers and individual contributors responsible for their organizations’ Agile and/or DevOps development strategies. Questions provided to the participants asked about their firms’ attitudes toward software development automation, risk management, and testing practices, as well as the metrics they track and value in the software development life cycle.